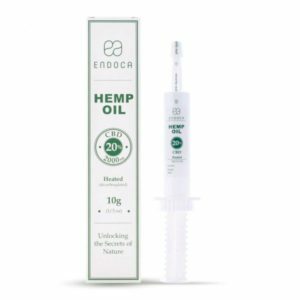 Endoca CBD Extract Paste is a thicker higher concentration oil that still contains the plant waxes. This paste is available in either a heated extract or raw formulation that was not heated during extraction. If you want the benefits of the whole hemp plant these pastes are for you. Thicker oil. Less filtration extract from a supercritical CO2 extraction method. The raw extract still contains the CBDa while the heated or “decarb” extract has been converted to all CBD. The 3000mg Raw CBD extract has been pushed through a hot filtration system to remove remaining plant waxes and chlorophyll but keeps the CBDa properties. This “Golden Hemp Oil” is the maximum strength smoothest extract for your palate. 2000mg CBD or Raw CBD/CBDa and 3000mg Raw CBD/CBDa strengths.